Chrichton's World: Review Batman Ninja (2018): Phenomenal artwork! Everything else is a mess! Review Batman Ninja (2018): Phenomenal artwork! Everything else is a mess! Watch the trailer for this animated film and then forget it's existence. And that is me being mild. What if I told you that the best bits of Batman Ninja are already in the trailer? I can't tell you how disappointing Batman Ninja is. I never had the illusion that this was going to be super good. But I had hoped that it would have been as crazy and wild as it was presented in the trailer. The very least the action was going to be bonkers and insane. If like me you expect that kind of thing then forget about it. While Batman Ninja is weird it's not weird enough. It's far too tame, conventional and predictable. Once again The Joker and some other familiar villains and heroes are called into action but apart from the usual shenanigans very little noteworthy things happen. I don't know. 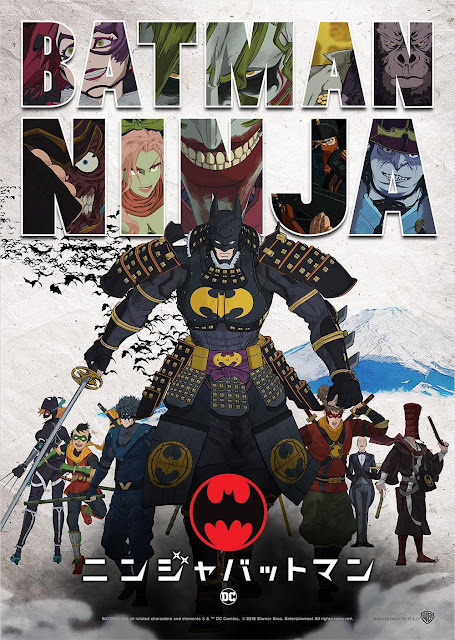 Having Batman and co transported to feudal Japan should have been far more interesting and somehow I was bored out of my mind. And I love everything ninja, Japan and Batman. So why can't I love this? I think I would not have mind the weak or bad story as much if Batman Ninja contained good action. We know Batman and what he is about. Would he really be so different in feudal Japan? No, he would not. Here Batman loses all his toys and wits. To the extent that he doubt his skills. I can tell you with absolute confidence that Batman while far from perfect would never ever doubt himself. In fact most of his skills are based on Ninjutsu. So if anything he should have fit right in. I think that the people involved barely knew the basics. I am wondering if DC even bothered consulting? If they did then somebody made a big mistake. If they didn't then I want to know what they were thinking. Despite the live action films the animated DC films all have been good to excellent. This doesn't even come close to being good. The concept and the premise was promising. But the end result is disappointing and boring. How can that be when events take place in feudal Japan? You even have walking palaces for god sake. A gigantic waste of time!